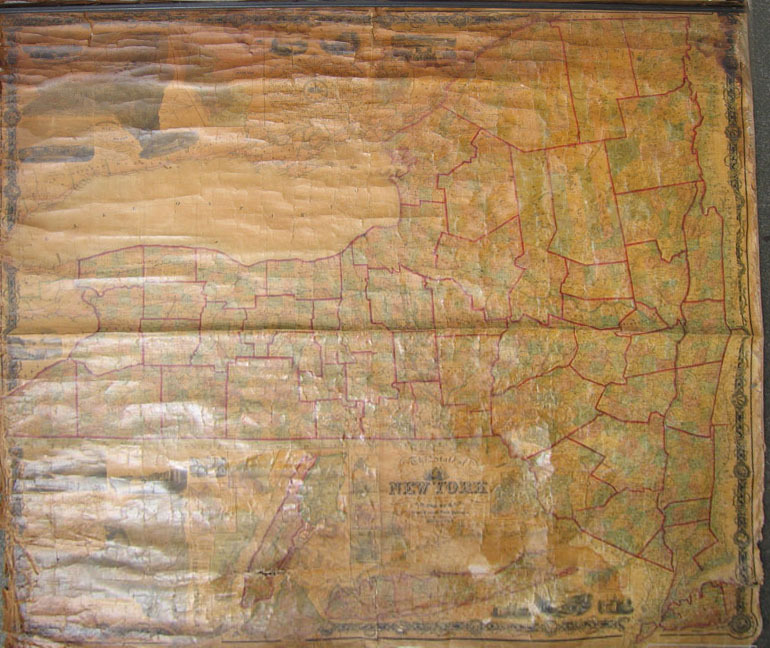 Antique Wall and Rolled Maps. 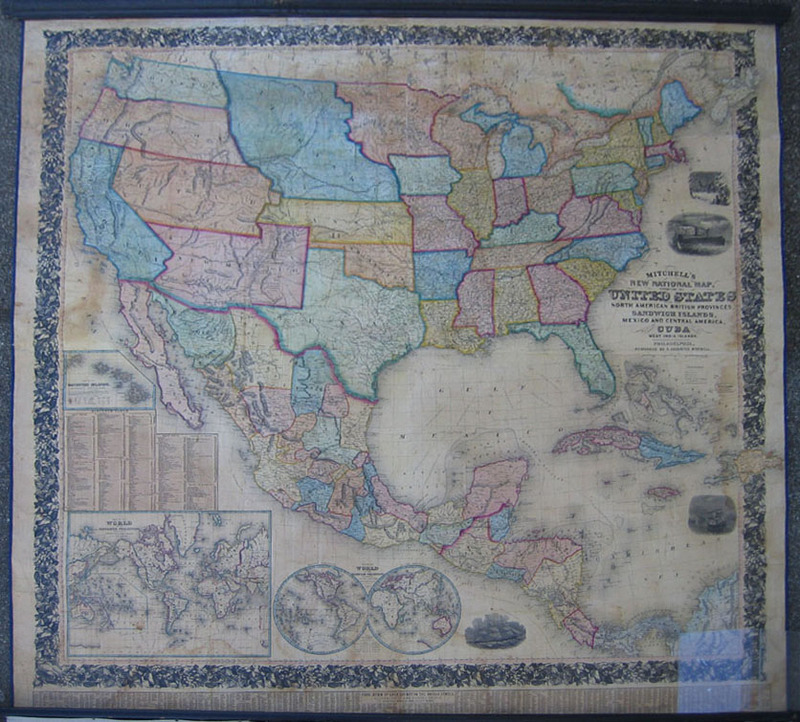 by Mitchell; Philadelphia showing United States East of Mississippi River Also states: Louisiana, Arkansas, Missouri; territories of Iowa, Wisconsin Parts of Dakotah (or Sioux Indians), Indian Territory and Texas. 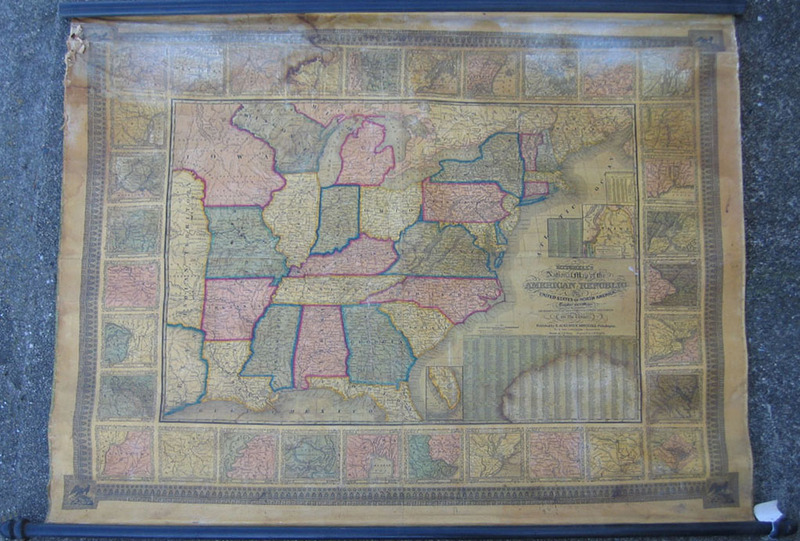 32 side insets of principal city from every state & D.C. also insets on map showing top of Maine; the North East boundary of US & bottom of Florida. Beautiful scroll border, eagle in each corner. 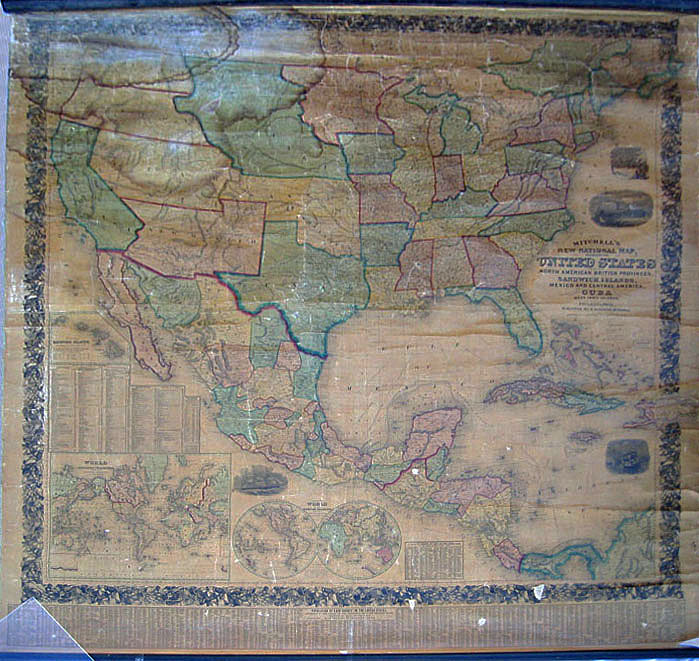 Table inset showing population of each county & the different states & territories. Green coded table lists white & black population Pink coded table lists city population Linen backing. 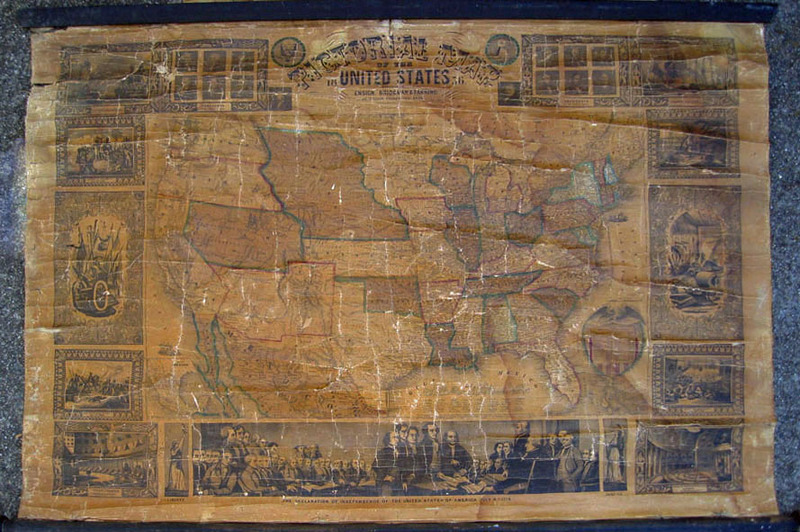 rdm_10: 1856 Pictorial Map of the United States. Published by Ensign, Bridgman & Fanning (William Street, New York). 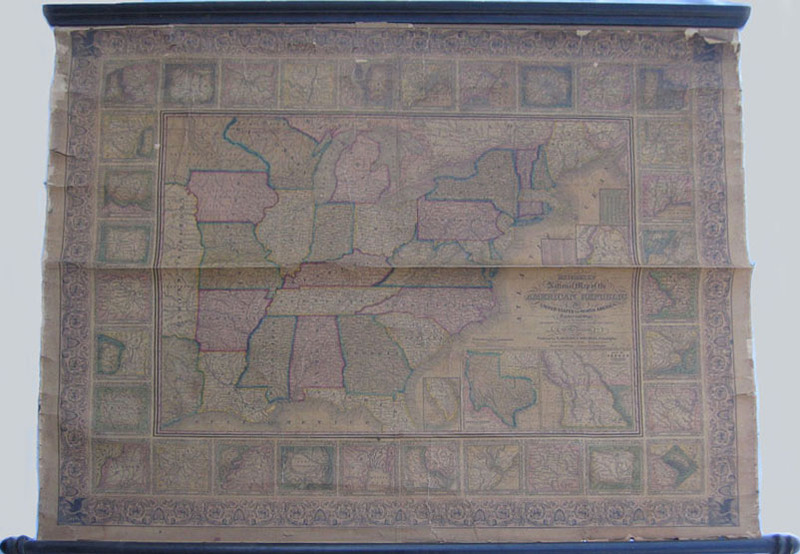 Wide border with engraved patriotic vignettes: i.e. Senate Chamber, Declaration of Independence, Capture of General La Vega, Constitution & Guerriere, Presidents, Liberty, Battle of Monterey. 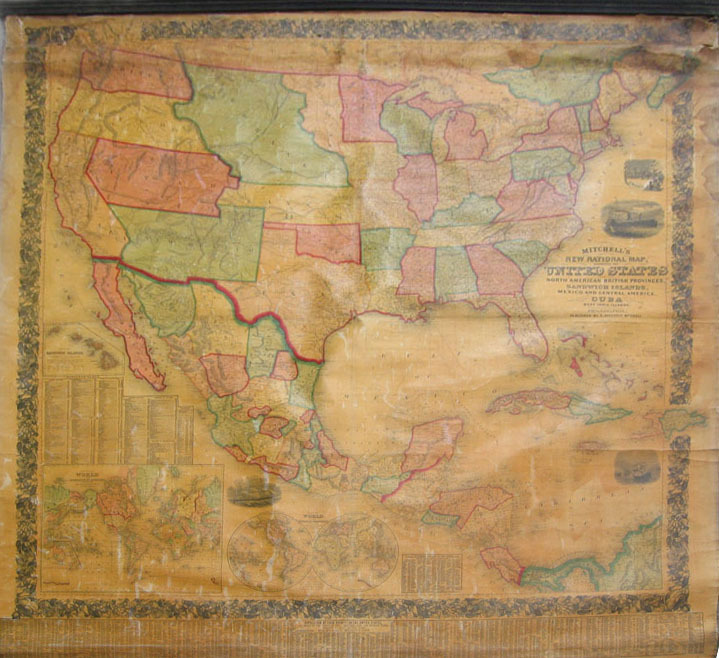 Inset of a Map of Mexico, population table 1850. Utah extends all the way to California. 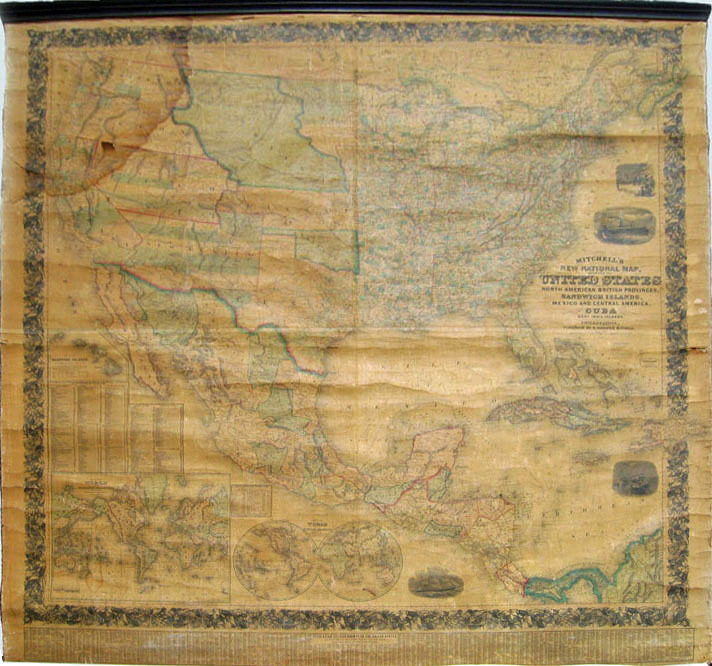 Also showing the Great Interior Basin, Minnesota Territory, Nebraska Territory (this area today includes Montana, Indiana, Wyoming, North and South Dakota) Puebla des Los Angeles, New Mexico (No Arizona) Indian Territory. Folds, cracks, scattered missing pieces. 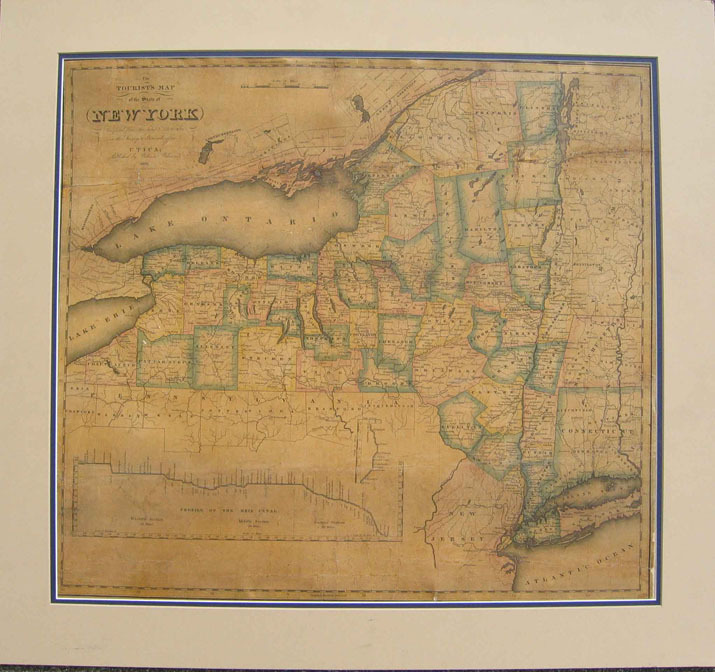 rdm_11: The Empire State New York with its counties, towns, cities, villages: Internal Improvements & c., 1845. Published by S. Augustus Mitchell, Philadelphia. 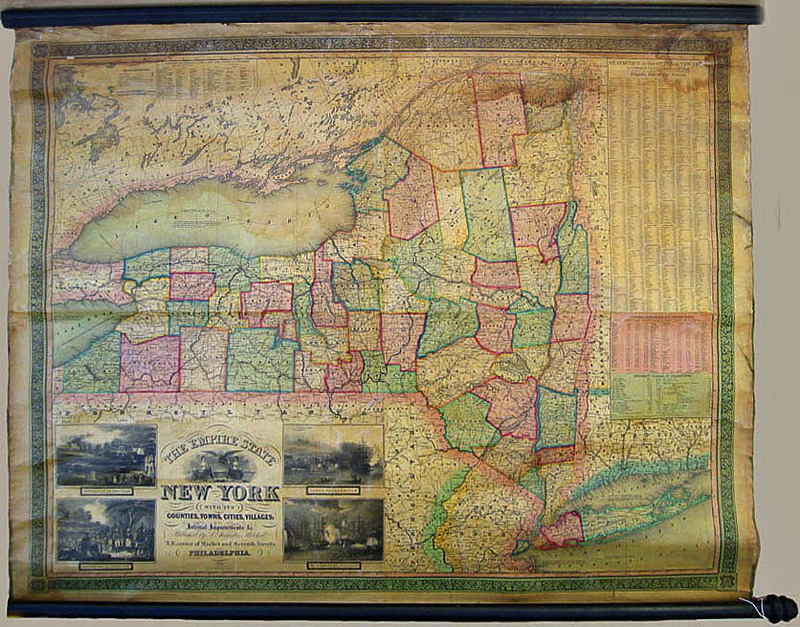 New York state with insets of Evacuation of New York, Surrender of Burgourie, Canal Celebration, Mc Donoughs Victory. 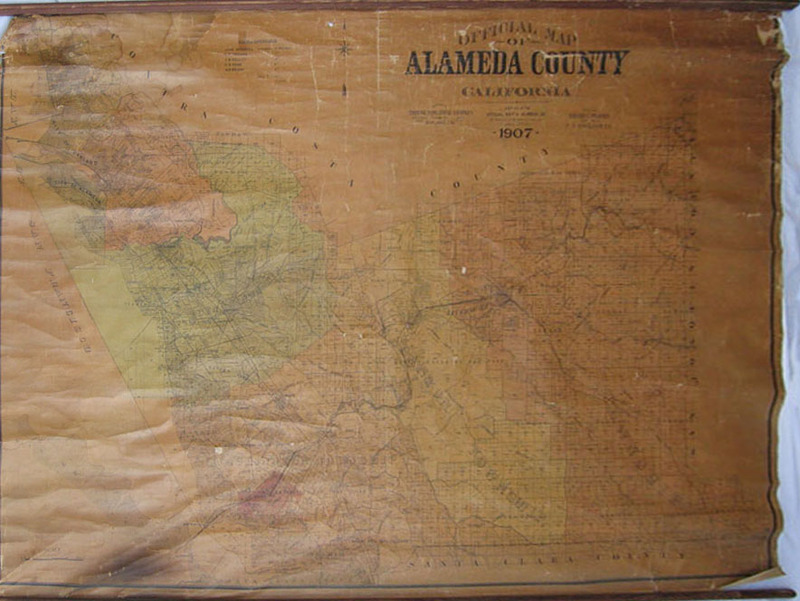 Surrounded by a decorative border, and each county is shown in a separate color. 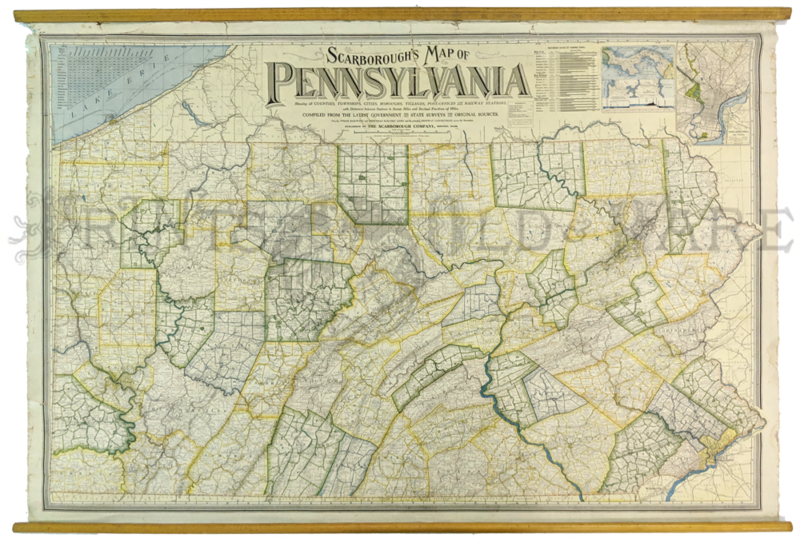 Insets of Different classes of inhabitants, County population & County, Towns & population of towns. Overall very good, some water stains on top margin, few chips near top. 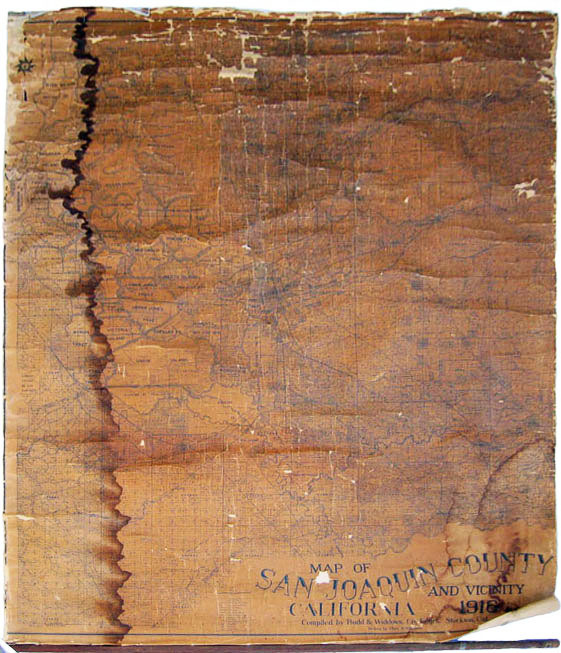 rdm_20: 1902 Map of the City and County of San Francisco. Published by W.B. Walkup, San Francisco. Map of subdivision and some notable buildings, San Miguel Rancho, Rancho Laguna de la Merced. Current Sunset District shown as Outside Lands. 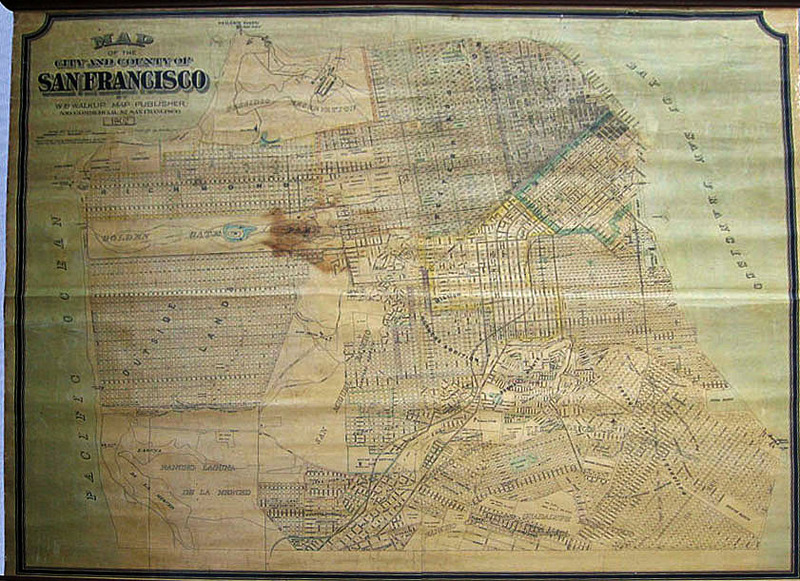 Rare Map of a Pre-1906 Earthquake City of San Francisco. 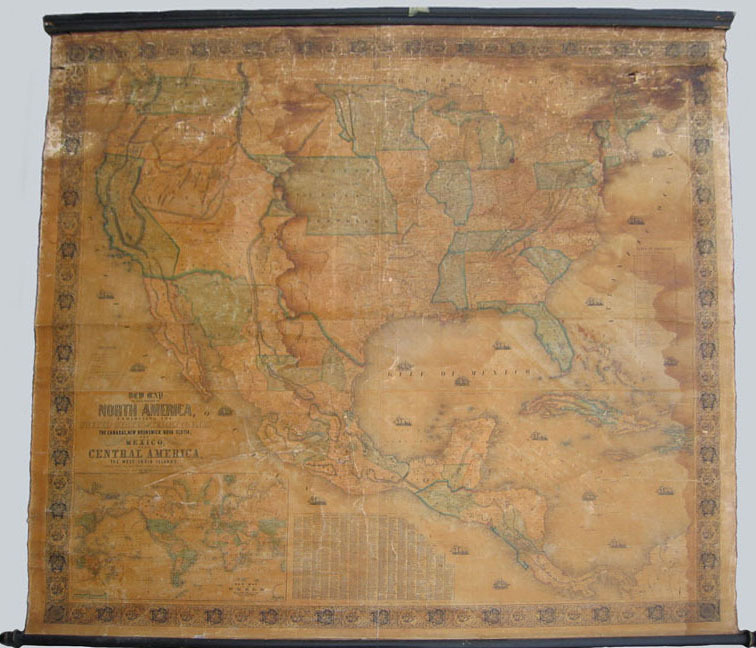 Very good condition except for brown stain in the center of the map. 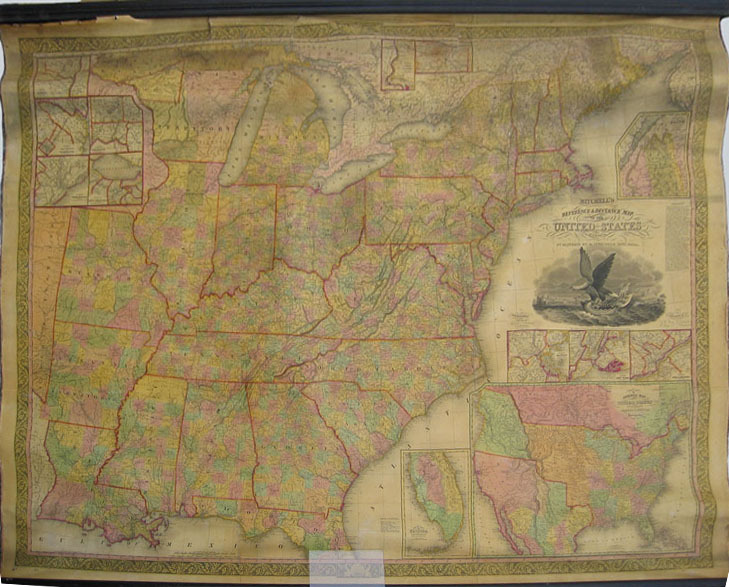 rdm_24: Mitchell's Reference & Distance Map of the United States by J. H. Young, 1836. Published by Augustus Mitchell. 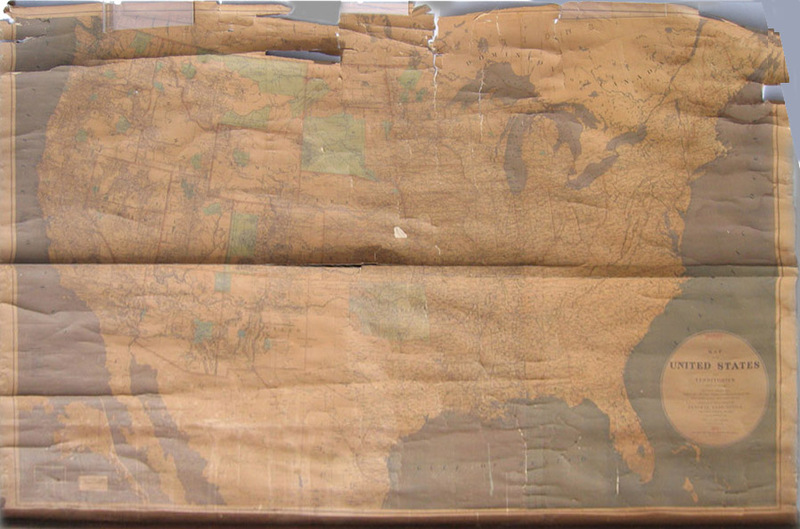 Inset: Whole US showing Western Territories: Missouri & Oregon. Whole Southwest still part of Mexico. Inset: South part of Florida / Boston / New York / Philadelphia / Main boundary. Vicinity of New Orleans, Charleston, DC, Cincinnati, Albany. 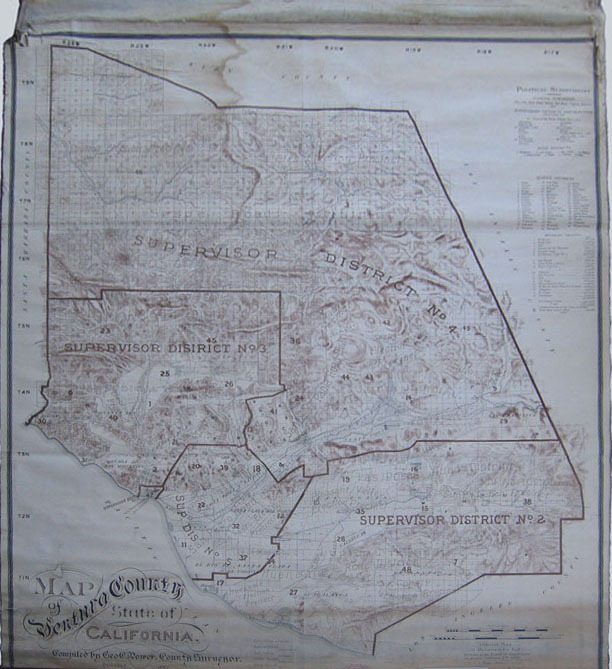 Also shows the Census of 1830. Newly backed on linen, very good condition, tear in the top middle border, some aging and discoloration; small hole in Lake Michigan. 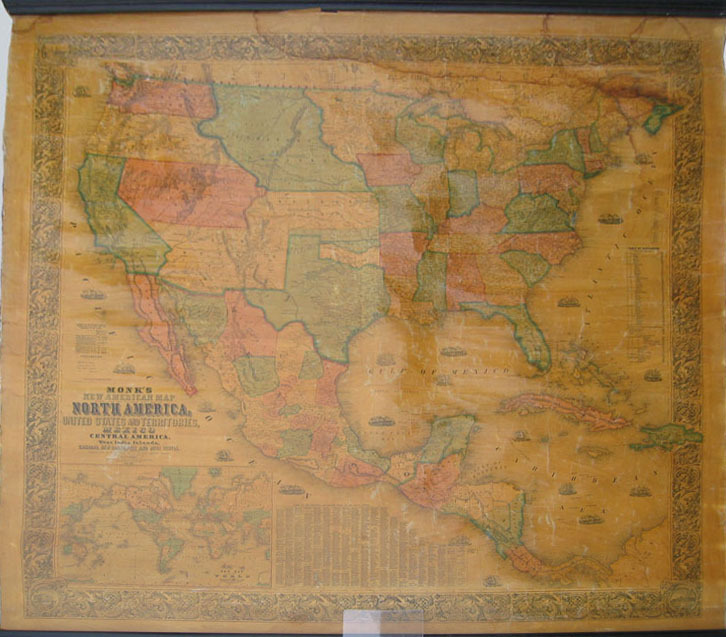 rdm_31: New National Map of the United States, North American British Provinces, Sandwich Islands, Mexico & Central America together with Cuba and the West India Islands, 1850. Published by Augustus Mitchell; Philadelphia. 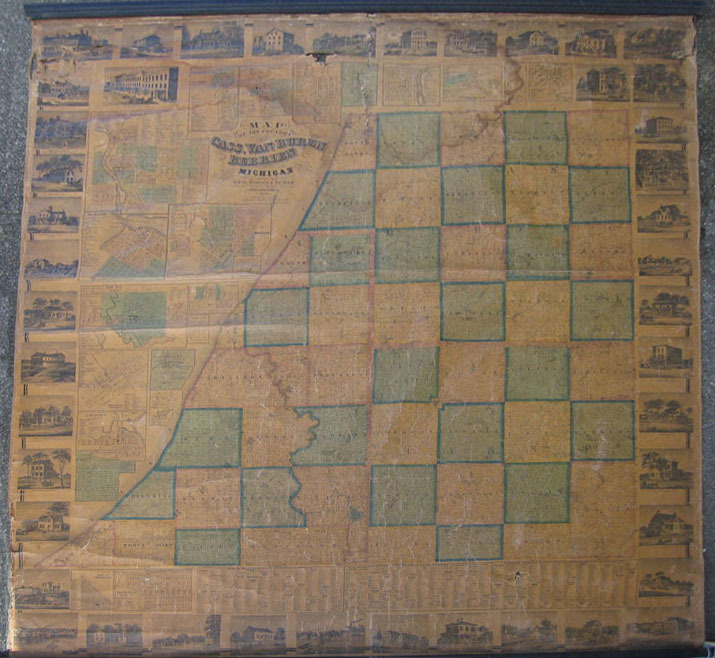 Extremely rare inset showing the Population of Each County in the United States 1850 census. 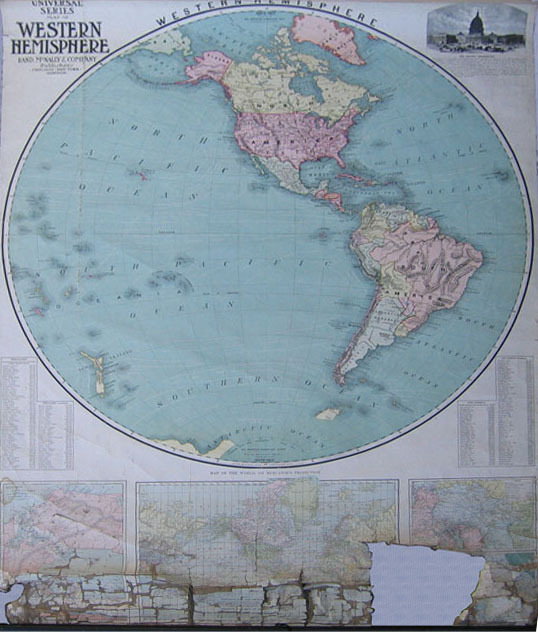 Map of World Mercator Projection. Map of Globular Projection. Distance Table by land & water routes, lengths of rivers, heights of mountains . Map of Sandwich Islands. 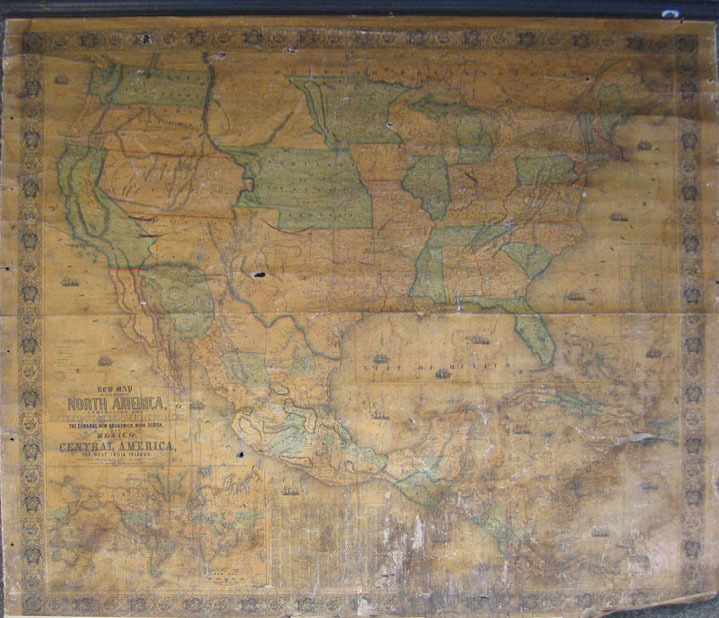 Great map of the West including Washington, Oregon, Nebraska, Utah, California, Texas, Kansas & Indian Territories. 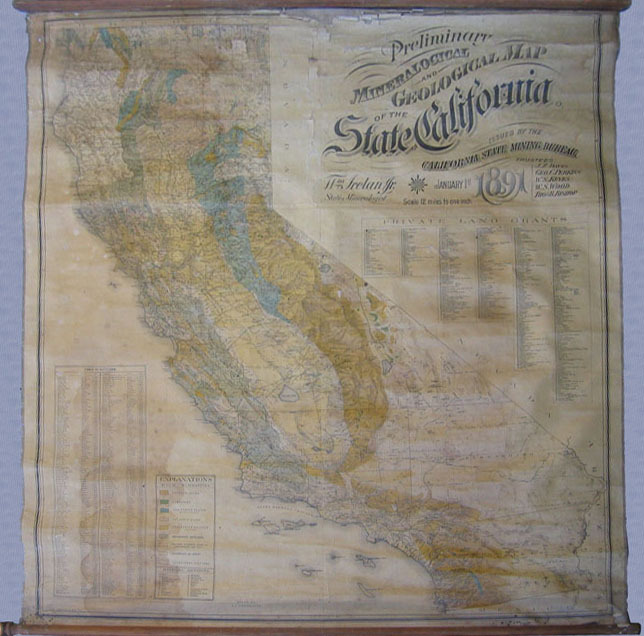 There are no states of Nevada, Arizona, Oklahoma or Minnesota shown on this map at this time. Condition good. Some chipping at edges; damage to right top corner deteriorated. 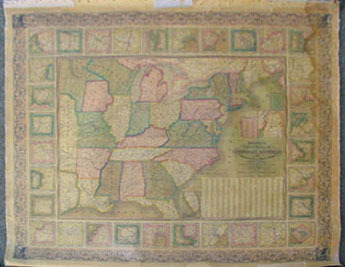 Map on new linen. rdm_33: The State of New York from New & Original Surveys under the Direction of J.H. French, 1859. Published by Robert Pearsall Smith, Syracuse NY . 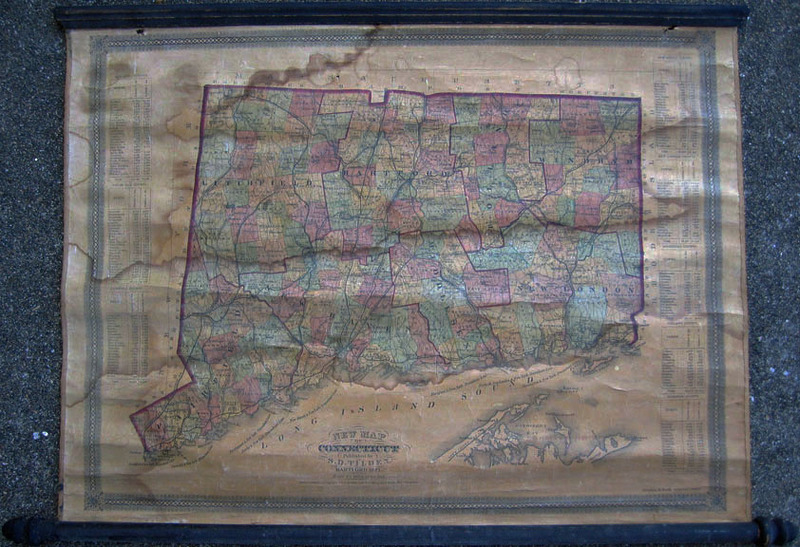 Inset: Land Patent map, New York City Area, Meteorological Map. Vignettes of State Agriculture College, West Point, NY State College, Syracuse, Oswego, Albany, Poughkeepsie, Schenectady, Hudson, Utica, Portage Bridge, City of New York, Genesee Falls. Clocks showing different times when it is noon at Albany. Damage to top & bottom. 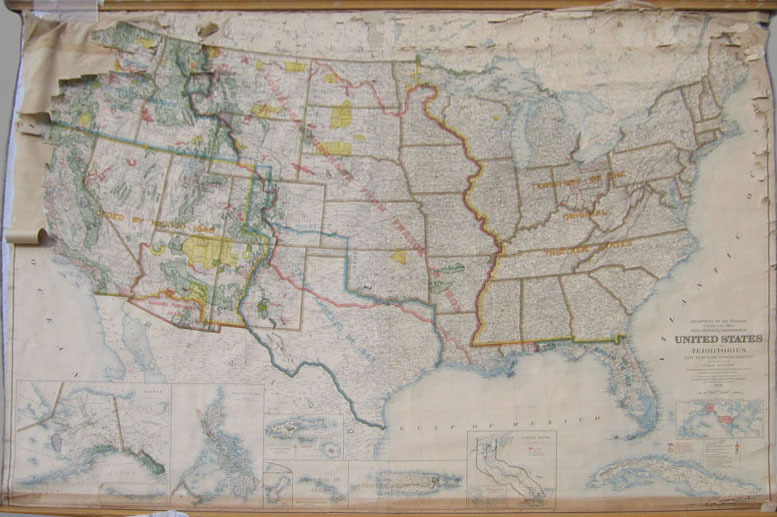 rdm_34: Map of the United States & Territories Showing the extent of the Public Surveys, Indian & Military, 1876. 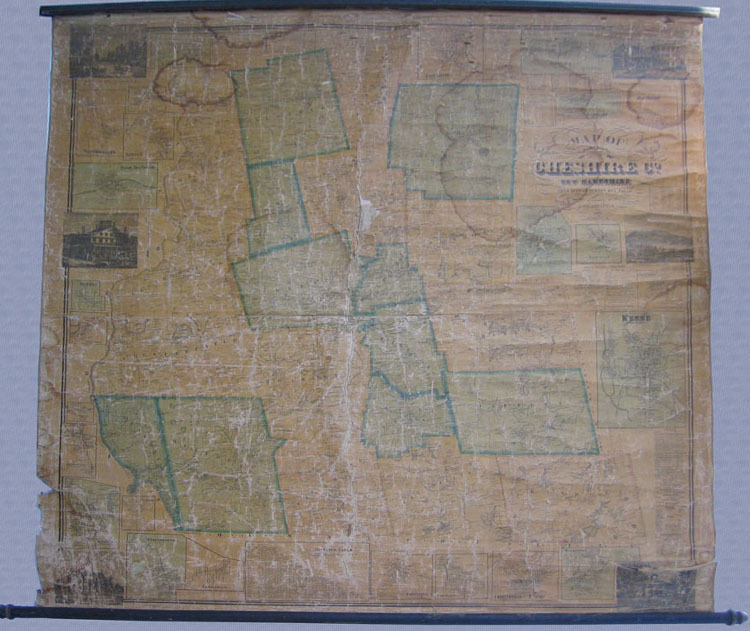 Published by General Land Office . In poor condition.